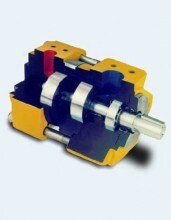 CIG (Crescent Internal Gear) pumps are produced primarily for fluid power applications and aircraft fuel test stands. They are available in multiple stages for very high pressure or moderate pressure on very low viscosity fuels. Pumps are also available in double pump configurations which share a common inlet port but deliver two independent flows for supporting multiple machine functions. Single pump flow rates from 1 to 125 GPM ( 4 to 475 L/M) with continuous pressure ratings to 5000 PSIG (345 BAR). Click the button below to add the CIG Gear Pump to your wish list.